Did you know that we sleep away about one-third of our lives? Assuming we get a solid 8 hours every night, and we live to the average age of 75, we have slept away 24.7 years! 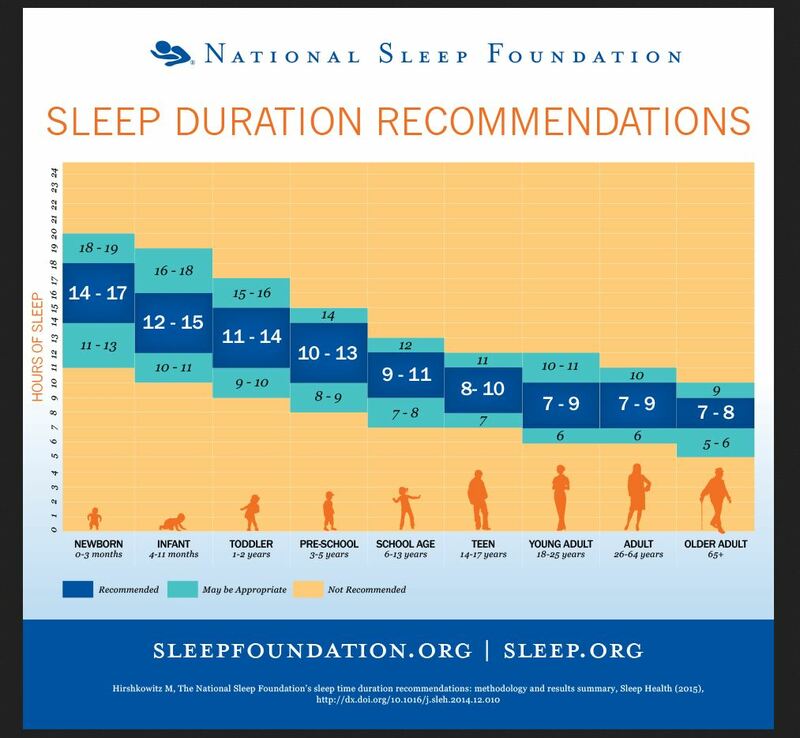 According the the National Sleep Foundation1, our sleep needs vary depending on our age. As we see on the chart, on average, newborns need somewhere around 14-17 hours per day and infants need around 12-15 hours. By the time the child is in school then 9 to 11 hours should be enough. As adults, we need about 7 to 9 and older adults (over 65 or so) need about 7-8. While we obviously cannot pinpoint the exact amount of time every individual needs to sleep, we do have some practical recommendations. 1) After you’ve slept for about 8 hours, how do you feel? Do you feel better, more productive, and coherent after 8-9 hours of sleep? 2) Are you overweight? (Fluctuating circadian rhythms affect our ability to lose weight). 3) Do you have to have caffeine to wake up or throughout the day just to get through work? 4) Do you feel sleepy when driving? 5) Do you work 3rd shift? If you answered yes to most of these questions, you might need to re-evaluate how much sleep you are getting. So for example, if you find that you can’t get going in the mornings without your trip to Starbucks, perhaps 7 hours is not enough and you actually need 8 to 8.5 hours. Sleep allows your hormones to balance out in the night. You actually secrete the proper amount of hormones while you are sleeping to help you burn fat, sleep better, regulate cycles, fight depression, think better, etc. How do you get great, quality sleep? Stick to a schedule, even on weekends. Your body will get used to the circadian rhythms if you follow a ritual at night (which includes a hot bath). Don’t watch TV or play on the computer for at least an hour before bed. The National Sleep Foundation found that 95% of people use some type of computer, video game, or cell phone within an hour before bed. Studies show that light from electronics can disrupt sleep, because it sends “wake-up” signals to the brain. Electronics keep you feeling alert and awake past your bedtime. Make sure your bedroom’s temperature is on the cool side and not too hot. Drinking alcohol or caffeine can disrupt sound sleep. Make sure your room is completely dark (wear a sleep mask if you can’t get it completely dark). Eat foods containing tryptophan, an amino acid in protein that helps induce sleep (turkey, eggs chicken, nuts). Also, eating some carbs before bed makes tryptophan more available (gluten free or whole wheat crackers with a tbsp. of peanut butter before bed is a good choice). White noise: you may have to listen to white noise throughout the night to drown out outside noises like car doors slamming or loud people. Here’s to a great night’s sleep tonight! Yoga and Sleep | Can Yoga Help You Sleep Better?